I smile at her, brimming with overconfidence: “Of course I can do it.” Famous last words. Chinese New Year is a national holiday in Indonesia, and so I took advantage of a day without classes to visit the home of one of my closest Indonesian friends, in a village just north of Malang. Because I had a meeting for students interested in joining a speech competition put on by AMINEF (the program I fall under while I am here) I was unable to follow her home the night before, and so we decided that I would join her the following morning, via motorbike. She lives a little over an hour from the campus where I live, much farther than I had ventured yet independently, but a distance I felt perfectly capable of conquering, armed with my official map drawn in hot pink. Instead, what should have been an hour-long ride turned into a three hour adventure. The trip started out just fine. My friend had picked out perfect landmarks, and at no point during the first half hour of my trip did I have to make use of my expert U-turn skills. I had left my house early enough that there was still only a reasonable amount of traffic on the road—a shocking turn of events in a city on Java—and so I was able to relax and enjoy cruising smoothly along in the still-cool morning air, shamelessly humming songs from Frozen within the safety of my new helmet. And then I got outside of Malang, and nothing looked like what had been described to me. I searched the sides of the roads for the landmarks I had been told I would see, but nothing seemed to match. Assuming I had somehow missed or taken a wrong turn at some point, I pulled over at the next warung to ask the Ibu there for directions. Terus is the Indonesian word for “continue,” and when used to give directions I have found it is almost always accompanied by an excessive waving of the hands, so there is no mistaking its meaning. According to the Ibu, I was on the correct jalan (road). Relieved that I was still on the right route, I thanked the Ibu and waved heartily as I drove away. Fifteen minutes later, I found myself on a road with nothing but rice paddies and sugar cane fields as far as the eye could see. I feasted my eyes on this gorgeous view for much longer than I should have before realizing that I probably already should have arrived in Lawang, if I was in fact still going in the right direction. I made my first U-turn of the trip, and drove back into the last kampung (town) I had driven through, to ask another Ibu for help. This time, when I asked where Lawang was, the Ibu pointed back towards Malang and said, “Terus Malang.” Apparently I needed to go back through Malang, the city I had just come from, to get to my destination. I was more than a little bingung (confused). I pulled out my now-very-crinkled map, determined to see if I could re-orient myself. This explained why the previous Ibu had insisted I was going in the right direction: there are apparently many areas with similar names surrounding Malang. Needless to say, Bululawang was not on my map. So I did the only thing I knew to do: I called my friend. It didn’t take long for her to ascertain just how lost I was. 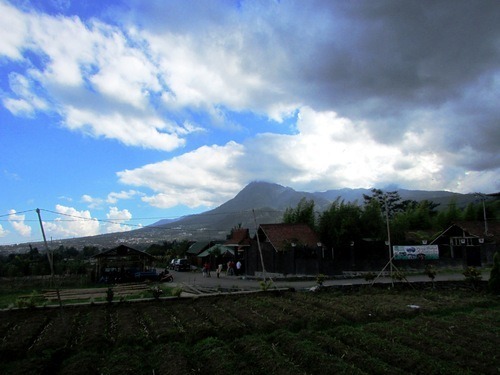 Lawang is north of Malang. Bululawang is east of Malang. I was still twenty minutes outside of the city limits… in the wrong direction. There was only one thing to do. I had to backtrack, a lot. My friend was not exactly sure how to get from Bululawang to Lawang, so it was up to my poor sense of direction and my little Indonesian to get me there. My friend gave me what she could: “When you get back to Malang, ask for Singosari. Then, when you get to Singosari, ask for Lawang. Then you should be able to use my map again.” I got off the phone with her, and was off, determined to end up in the right place eventually. across. Becak drivers know the streets better than anyone, and they are, more often than not, friendly older gentlemen whom I find far less intimidating than the younger men whose friendliness is laced with everything that makes me feel uncomfortable as a woman traveling alone. Speaking slowly, and painting detailed pictures with his hands of the statues I would pass, he soon had me off in the right direction. There was just one tiny, little problem. I needed to pee. Badly. school alone. They are the only places I know which are guaranteed to have public toilets available, so I kept my eyes peeled for their familiar red-and-white sign. 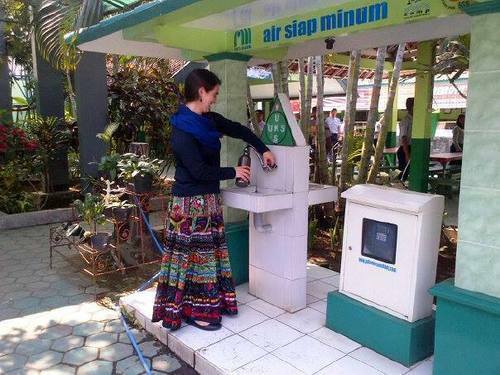 But there wasn’t a single Pertamina in sight. Needing to pee while driving is never comfortable. Needing to pee while driving a motorbike is an experience I would not wish on anyone. I was audibly cursing my daily dependence on instant coffee and practically in tears by the time I finally came across a Pertamina, my oasis in my time of need. A dirty squat toilet has never looked so beautiful. Much more comfortable now, even if a dull ache was beginning to form in my lower back, I confirmed with a friendly Pertamina employee, whose smile was as wide as the Indonesian archipelago, that I was still going in the right direction. Very soon, I found myself in Singosari. I shamelessly did a little dance as I was driving: I was getting closer. I stopped at yet another warung, to ask how to get to Lawang (“L-A-W-A-N-G”). This particular warung was run by an adorable elderly couple, who cheerfully bickered about the details of the directions they were giving me. It’s good to know that even on the other side of the world, partners in life will argue over the difference between five and three kilometers. Once I finally reached Lawang, it was just a matter of finding the train station, so that I would know where to turn. As I peered down side streets I could see that the train tracks ran parallel to the street I was on, so I knew I had to be close. I searched the side of the road for signs that read “Stasiun Lawang,” or perhaps “kereta api” (train), but to no avail. Finally, I performed yet another U-turn, and eventually pulled over to ask for directions from a middle-aged gentleman who looked to be out for a morning stroll, but who might also have been on his way to somewhere important (I never can tell here, because Indonesians almost never rush). It seems I had pulled up in front of the train station to ask where the train station was. Slightly embarrassed, I thanked the bapak and continued on my way. I found my friend’s road easily after that, and though I still passed by her house and had to turn my bike around for the…well, to be honest I had lost track of my U-turns by that point, I did eventually arrive at her front door, safe and (mostly) sound, complete with helmet hair and a sore bum, two hours later than I should have. I spent the rest of that day enjoying the delights of my friend’s village, touring a local tea plantation and eating her mother’s delicious cooking (and acquiring a few recipes for said cooking). I hope that I will eventually be able to return to her village and explore it further: it really is a beautiful area, and having the time to spend more than an evening with the woman who has become so much a part of my life here. I just hope that next time, I won’t get quite so lost on the way. Not that I really minded being lost, to be honest. The ride was fairly picturesque, and there is a certain peacefulness that can only be achieved astride a motorbike. And, though I did not have the faintest idea where I was supposed to be going for most of the trip, I always knew how to get home, and so I never reached that scary kind of lost that happens when you truly have no idea where you are. 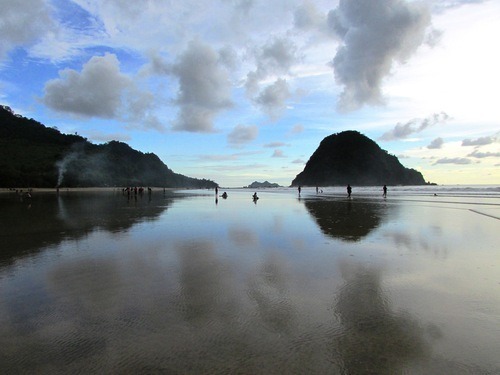 I spend a considerable amount of time lost in Indonesia, in a variety of different ways. 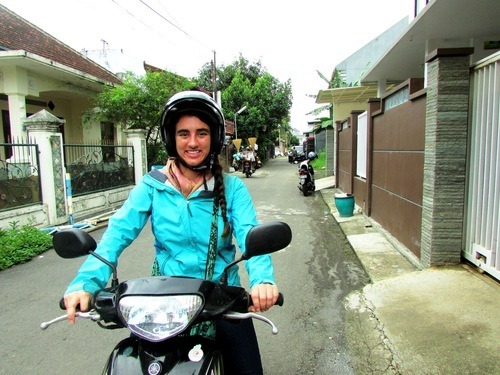 I am lost almost every time I go somewhere new on my motorbike; I am lost by the conversations of quick-fire Indonesian and Javanese that surround me every day; I am lost as I try to muddle my way through unfamiliar educational regulations and traditions. Being lost is no longer a state of being for me, but a part of my personality. But just as I was never afraid during my trip to my friend because, at the very least, I knew how to get home, more and more I have come to embrace this feeling of being lost, because though I may not fully understand the situation I find myself in, I still have not lost sight of home. By home, I don’t necessarily mean the small dairy farm in Central New York where I will return, at least for the summer, after my grant. By home, I don’t mean New York, or even the United States. Home is storytelling and home-cooked food. Home is family and friends, and the blurred line in between. Home is peace and conflict, laughter and tears, hope and temptations of despair. Home is, in short, everything that lets me lay claim to being human. All of which I am able to find here. It might be a spicier version of home dressed in far more colorful clothing, but stories and food and community and all the contradictions that give us life are still here. This can still be home. This is not to say that I am planning on moving to Indonesia permanently. I’m not sure that I could spend my entire life this far away from my family, and there is something about four seasons that calls my heart back. But I am beginning to see how home does not need to be found within a dwelling, or even within a particular country’s borders. Home can be Planet Earth, with an expansive extended family and potential friends around every corner. Home can be here, and there, and anywhere and everywhere and nowhere at once. And so long as I have this, this vague, idiosyncratic idea of home, I will never really be lost. I still have not perfected the accent for the Javanese version of Bahasa Indonesia, and consequently have gotten really good at the Indonesian alphabet. Asking for directions always turns into a spelling bee. If you are familiar with the idea of a rickshaw, you understand what a becak is. It is not uncommon for me to hear my name slipped into conversations held entirely in Indonesian or Javanese, and I confess that at first this caused me great anxiety. (What are they saying? What did I do wrong?) But as my Indonesian has increased, and as I have become more proficient at deciphering the hand motions and facial expressions that accompany the Javanese of the teachers around me, I have begun to piece together the impression of myself I have left for those whom I interact with on a regular basis, namely, the people at my school. It is sometimes comical the parts of me which have become emphasized so far from home, but it is still somehow accurate. And so, accompanied by various photographs taken by one of my co-teachers, I present to you Miss Grace, as seen by her school. Miss Grace is a teacher. There many parts of my identity that I have chosen to conceal while I am in Indonesia, but if there is one part of me that I do not need to hide, it is that I will stop at nothing to ensure that my kids will learn. I stand on chairs to orchestrate rousing rounds of “Would You Rather?,” I dramatically fall on my bum in front of the class in order to demonstrate the difference between “feel” and “fell,” and I run around like a mad woman—sweat dripping down my back and my hair steadily escaping the braid that vainly tries to contain it—calling out “Yes! Perfect! Fantastic! Hati-hati, fly is an irregular verb! Wonderful! Yes!” as my students hurry to write their past-perfect conjugations on make-shift white boards. I might sometimes stumble through some of the cultural differences here, and I’ll admit that I have, on occasion, sat in my room with all the lights off, taking advantage of my Kindle’s backlight in order to hide from the world. But whenever I am in the classroom, I am on. I had not anticipated that my teaching would be the part of me that would be most noticed, but somehow it has been. “Selalu creativ. Selalu inovativ” (“Always creative. Always Innovative”), says the head of the English department after I explain to her one of the activities I plan on using in class that day. “Grace, you are a real teacher,” says my counterpart as I tweak the same activity during the short walk from one class to the other, because I think I’ve found a better way to link it directly to the objective for that day’s lesson. It did not take me long to develop a reputation as a teacher first, and a foreigner second, and I truly believe this is how I have developed such good relationships with some of the teachers outside of my discipline here, even if we do not speak the same language and have little else in common beyond our shared love of students. There is something is something universal in the stubborn belief that all students can and should be encouraged to learn that stretches across cultures, even if they are a world apart. I do have to be somewhat careful about how dedicated I am to my teaching. Rajin (hardworking) is a word often used when describing me, and, coming from a working class American background, I assumed at first that this was a good thing. But here the personal relationships you develop with your coworkers are just as—if not more—important than your effectiveness. I’ve tried simultaneously working and socializing, but I have found that this usually ends conversations prematurely, because people are afraid they are bothering me. “Sibuk, sibuk” (“Busy, busy”), they say and walk away, even as I insist that I can cut out flashcards made from recycled cereal boxes and talk at the same time. Sometimes, I have to accept that I will need to finish my materials for next week’s lessons at night, rather than during a free period (the habit I developed during student teaching), because that free period needs to be used to smile and joke with the math teacher who has the same free period. It’s a unique balance of work and play, a difficult balance for this ex-farm-girl who is accustomed to juggling three jobs every summer, but I am beginning adjust to it. Miss Grace likes to bake. the best purchase I have made here (excepting my motorbike) is a toaster oven. Indonesians rarely use ovens in their day-to-day cooking, relying instead on their gas stoves as they fry, well, pretty much everything. I come from a family of excellent bakers (my father’s chocolate chip cookies are to die for, and I’ll only share my mother’s pie crust recipe with you if I really like you), and so the idea of going nine months without baking once almost broke me in a way that language barriers and cultural differences could not. Thus, the toaster oven. Miss Grace is naughty (but not always in a bad way). I have tried to conform, at least somewhat, to the culture in which I find myself. However, I am who I am and sometimes that just doesn’t quite fit in. 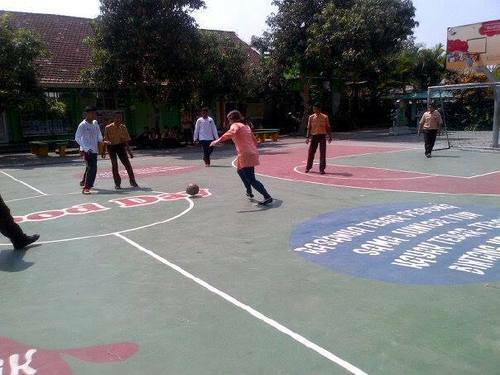 I first heard the word nakal, the Indonesian word for naughty, when I kicked off my teaching shoes and joined a game of soccer with some of my students. “Girls don’t play sepak bolah,” the teachers told me. I tried to tell them that girls do indeed play soccer in many, if not most, parts of the world, and often with greater intensity than the boys, but they just shook their heads and said, “You are so naughty, Miss Grace.” Worried that I had committed a serious no-no, I put my flats and skirt on, and I have not touched a soccer ball since. More recently, however, I have started to learn that being called “naughty” might not necessarily be a bad thing. The first time I filled my water bottle from the student water fountain, refusing to accept another plastic bottle, the co-teacher I was with at the time called after me, “You are so naughty, Grace!” But she has never actually tried to stop me. Later, when I began riding my motorbike, the word nakal was often used in the same sentence as berani (brave), and while I feared disapproval for driving a motorbike, I have, rather, been encouraged to go farther and faster. It seems nakal, in this context at least, is less of a condemnation and more of a recognition that something does not quite fit into a certain set of norms. More and more, it seems as though my ibu-ibu take great amusement in the many ways I twist and break the rules, and I’ve slowly begun to embrace my nakal status. Next time a soccer ball is being passed around, you can be sure that I will join in. Miss Grace is learning (if slowly). My language learning has progressed much slower than I would have liked, and I am well on my way to becoming a master of the Indonesian U-Turn, since I am infamous for taking the wrong turn no matter how many times I have driven a particular route. There are days when I want to throw up my hands and accept that I will never have a solid grasp on anything, ever. I have been making progress in learning the language, the culture, and the street layout (okay, maybe not that last one), during my time here, but sometimes that’s hard to recognize on my own. As I’ve tried to understand what how others see me, I’ve also learned that, even after twenty-two years of listening to people tell me that we are often our own worst critics, and sometimes too hard on ourselves, I do not always see myself clearly, and I cannot be more thankful for that lesson. Miss Grace is starting to fit in. My light skin, my forever slightly-western attire, and the fact that at 5’4” I am even taller than many of the men on my campus mean that I will never really be able to blend in at SMAN 10. Nonetheless, I am beginning to find a place into which I can fit my irregularly-shaped piece into this giant puzzle of two campuses, dozens of teachers, hundreds of students, and thousands of stories. I joke with the guru-guru in the teacher’s room; the gardeners and cleaning crew (a ragtag group of young men and middle-aged women who constantly shirk their work to hang out behind the buildings, and who are some of my favorite people here), have learned not to worry when I trip over my own feet, but to laugh instead; security recognizes my rain jacket and motorbike now, and so I no longer need to raise my visor when I come through the school gates; and if I miss a Study Night or school event, people are immediately concerned, because it has become assumed that I will always be there. At Parents Day, one of the biggest events of the new semester, I found myself sitting in the middle of all the teachers in attendance. I didn’t have the same batik they were all wearing, but I was able to show up in similar colors; and even if there was a chorus of whispers from parents when I was introduced with the other teachers, the students and teachers did not blink an eye: to them, I was just another member of the larger school community. My identity shifts almost daily here, in the eyes of those around me as well as my own. But whether I am know as a teacher, a baker, or a trouble-maker, I am forever Miss Grace, the ETA at SMAN 10 with room to grow. This co-teacher is constantly snapping pictures of me in class, something I admit I found quite strange at first. The upside to this is that I actually have pictures of me teaching, and generally going about my day at school. I will forever worship the ground Professor Linda Hanrahan walk upon for telling my student teaching cohort how to make these. For those who don’t know, if you take a plastic sheet-protector and put a piece of paper inside it, you have an instant white board for your students to use. It’s a game changer for teachers with too many students and not enough funds. Due to a confluence of personal reasons in no way pertinent to this blog, this past week was rough. I slept far too little, I called home too many times, and I arrived to school late on two consecutive days. It wasn’t pretty. I won’t go into the details, but I will say that sometimes the most difficult part of being in Indonesia isn’t being here, but not being there. I’ve had a few low points during my grant thus far, and this was definitely one of them. But as it so often does, Indonesia provided a series of small joys to counterbalance the negative feelings that were infiltrating my day-to-day existence. A group of Indonesians, predominately from one of the many universities in Malang, comes together to play badminton for a few hours every Friday, and I have become a semi-regular attendee. Badminton is single-handedly the greatest stress reliever I have found in Indonesia, save only hanging out with my students after classes, and it is something I hope to explore further in a later blog. For now, I’ll just say that the swish of a racket as it arcs towards a birdie has become a sound I can only associate with calm. A few hours of alternating volleying and intensive game-playing was exactly what I needed at the end of this week. My Saturday was a lazy day of sitting in various cafes and restaurants with my lovely sitemate and some Indonesian friends, breathing in too much second-hand smoke and drinking what is hands-down the best kopi (coffee) on earth, even if it is sweetened with a shot glass of what can only be high fructose corn syrup, or some other equally bad-for-you syrup. And that night my sitemate and another friend accompanied me to movie night at my school, which was the perfect sort of relaxed fun and laughter, medicine for the soul. One of the Fulbright researchers is placed in Malang, and she is a Peace Corps Alumni; during her three months of training, she lived with a host family in a desa (village) near Batu, a neighboring city where I have previously planted trees with my sitemate’s school and attended English Camp with my school. 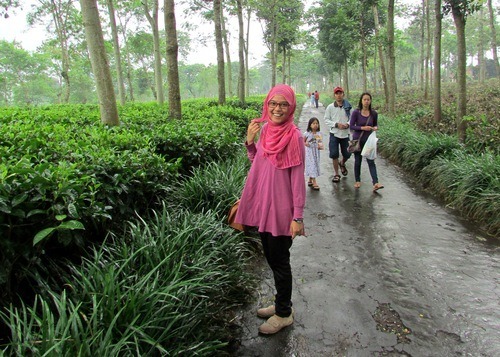 She invited me to come with her to visit them, and I jumped at the chance to get out of Malang and into the mountains. 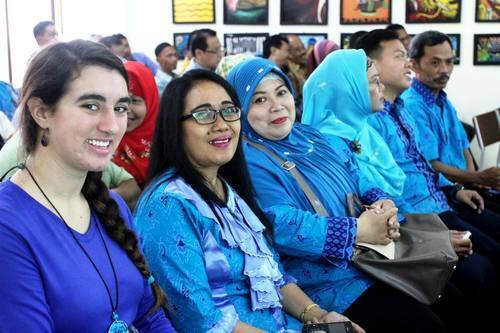 Her family was delightful, the kind of welcoming that only Indonesians can be. Her host mother is the epitome of Indonesian wonderful: she makes delicious tempe, and has the most infectious laugh. Her host father is the sort of chain-smoking kind-hearted you only find in bapaks. I wanted nothing more than to find a way to slip into their family circle. Her host father is also kepala RT (essentially the head of the neighborhood), and so various members of the community, from employees of his construction company to the one policeman in the desa, stopped in while we were there to chat and to drink the teh manis (sweet tea) that is essential in any Indonesian interaction. Because I live in the asrama (dorm) of my school, I spend considerably less time in strangers’ houses talking to adults than many of the others in my cohort. There are advantages to this of course, but I can’t help but feel there is something missing from my Indonesian experience. Sitting in their living room, snacking on roti goreng (literally fried bread—think fried dough, and you essentially understand the food I am referring to) and mostly not understanding the conversations around me, I found a small hole in my heart being filled. This was what I wanted from my Indonesian experience. And if the day hadn’t already seemed perfect, her family was also able to lead me to cows. There were only four cattle in their small barn, two yearlings and two adorable four-month-old bull calves who were nameless before I dubbed them Bruce and Franklin (it’s Bruce in the picture above). I am unsure if these cattle are being raised for beef or dairy purposes, because the nanek (grandmother) of the family mostly speaks Javanese, and did not understand my question when I asked, but there is not denying they were Holsteins, which is the most prominent breed on my family’s farm. 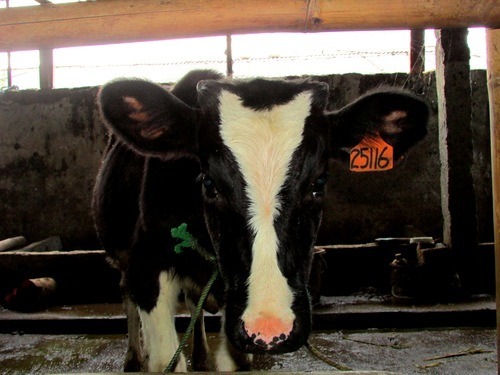 I’ve enjoyed the various Indonesian breeds I’ve stumbled across, many of which originated in India or Australia, but there is something about familiar black-and-white spots that gave these little fellas a special place in my farm-girl heart. 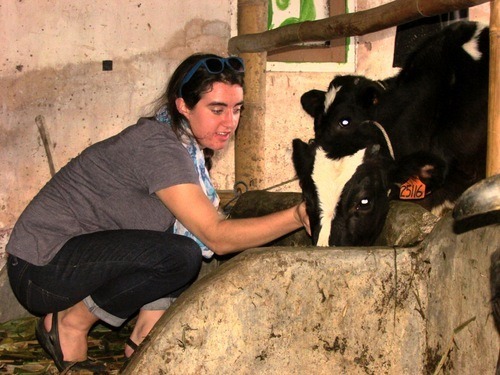 Scratching them behind the ears and enjoying sloppy bovine kisses, I decided that my day in my friend’s desa was the definition of a perfect day. This is not to say that this weekend was devoid of uncomfortable moments or frustrations. While I was in my friend’s desa a woman we met asked about my acne (thank you, excessively hot classrooms and inescapable fried food), and after hearing what it was, immediately rubbed her hands all over my face and then washed her hands, insisting that would get rid of it, if I only believed. It’s a testament to how long I have been in a country that does not believe in personal space that I was mostly unfazed, if a little bingung (confused), by this interaction. I also drove at night for the first time on my motorbike, and due to having eyes that do not focus correctly, this was exceedingly difficult, and more than a little terrifying. But these small moments could not overshadow the absolute joy that this weekend was filled with. out most in my mind. They are the reason why, even so far from home, even when my days are long and only marginally successful, I have found bahagia (happiness) in Indonesia. This is not to say that I missed classes, because it would probably take a national emergency or hospitalization for that to happen. But while normally I am the first teacher to arrive at school even when I do not teach during the first period, this week I slipped into the office only just in time for the classes I teach. I also hope I am able to blog about movie nights at some point. These are not nights of merely popcorn and a film, as the name might imply, but are, rather, huge events that include costumes, performances, and sometimes even fireworks. SMAN 10 knows how to do movie night. I’m an irresponsible patient and I don’t remember the name my eye doctor gave for this; all I really know is that it has something to do with my optical nerve, and is the reason why I have to wear reading glasses. Hundreds of gedung-gedung(mountains), many of which are actually gedung-gedung api (volcanoes, or literally “fire mountains”), dot the landscape of the Indonesian archipelago. East Java is a particularly mountainous region, with the famous Bromo and Semeru mountains practically in my backyard (okay, they’re not quite that close, but you get the idea). During a visit to a tourist information office early in my time here, I acquired a map of the area immediately surrounding Malang, and it is currently taped to my bedroom door; I have been staring at the names of various beautiful places for five months now, waiting for my chance to meet them in person. Patience always pays: this past weekend, I was finally able to climb a nmountain. Kawah Ijen is much further from my home in Malang than either Bromo or Semeru, and that it was my first mountain to climb here has gotten me more than a few confused looks from people at my school, but I’ve learned not to question the way in which events unfold here in Indonesia. One does not simply turn down the opportunity to climb a mountain just because you “ought to” climb a closer mountain first. 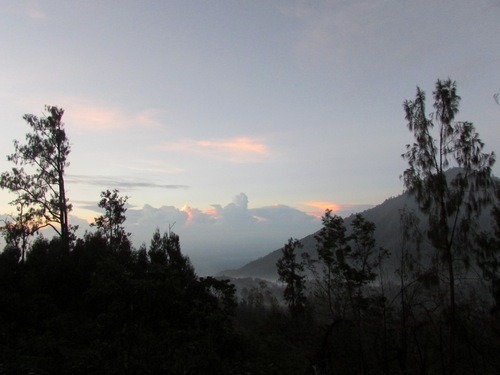 Because it takes so long to reach Ijen, we had to choose a place to prepare for the start of our early morning climb. 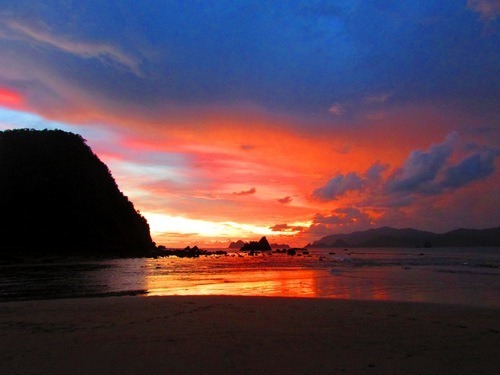 For our group, it was Pantai Merah (Red Beach), a stretch of beautiful coastline along the southern edge of East Java. After six hours in a mini bus with my site mate and some students from a local university whom we have befriended, we reached our first destination, and went running across the pasir (sand), and into the laut (sea). We arrived at Pantai Merah just in time for matahari terbenam (sunset), which did not fail to impress. We did not sleep at all that night, choosing instead to sing Indonesian and Western pop songs as we waited for when we would leave for Ijen. At midnight we left Pantai Merah and headed to Kawah Ijen. It was still dark when we first started climbing, and as the pale morning light began to cast its spell over the landscape, we found ourselves surrounded by misty morning mountains, the kind that belong in an epic fantasy film, not real life. After almost two hours of climbing through the mist and the majesty, we reached the edge of the kawah (crater), full of excitement and pride. Kawah Ijen is over 2,700 meters (over 9,000 feet) above sea level, and while it is neither the highest nor the most difficult mountain I have ever climbed, it was also not the easiest hike I have ever been on. Standing at on the precipice of a still-active volcano, high enough that I’m not sure if we were surrounded by fog or clouds, I felt as though we had conquered the world. shivering. 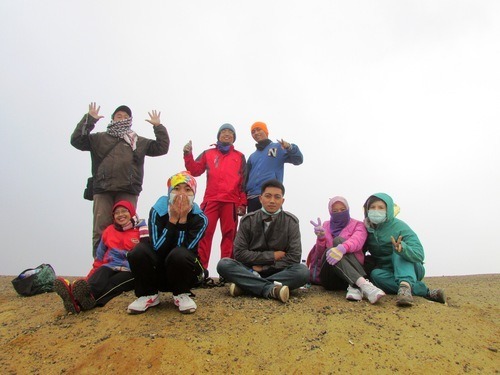 It was the first time I had really felt cold in Indonesia, and I reveled in the glory of it all. We could not at first to really see the crater lake below, but at matahari terbit (sunrise), the fog began to lift, and the blue-green water below was revealed. 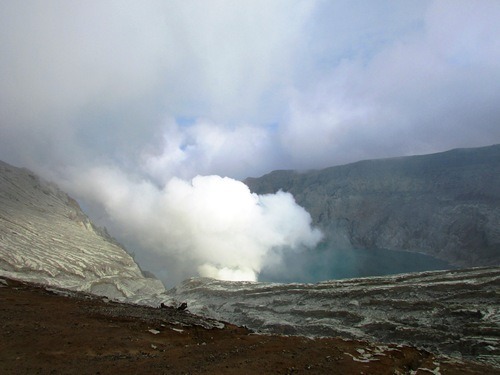 Kawah Ijen is the largest highly-acidic crater lake in the world, with a surface area of almost half a kilometer square (about .15 mile square). As steam (or fumes—to be honest, I’m not entirely sure what they are), continued to spill out of the crater, we relished in how small, insignificant, and unstoppable we are in the face of such natural power. The lake’s high acidity is caused by the incredible amount of sulfur that is in it. 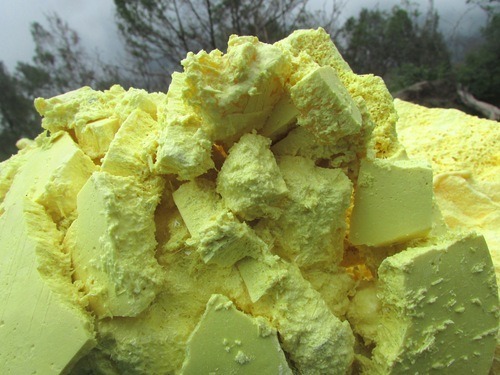 This elemental sulfur is a valuable natural resource, and it does not go unnoticed. The sulfur is mined mostly by hand and carried down the mountain by men in baskets. 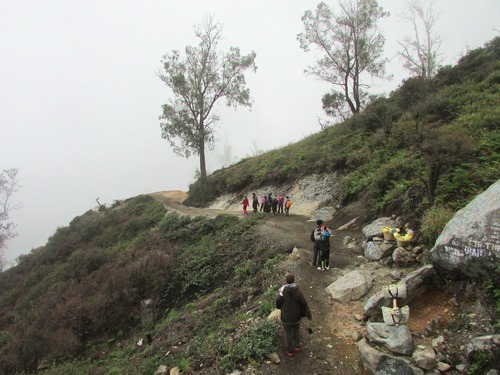 On each trip, the men carry around 70 kilograms (150 pounds) all the way down the mountain. They wear rubber boots or flip flops, and no extra support for their shoulders or spines. They also do not wear sufficient protection for their lungs, and many have respiratory problems. I saw old men hunched over with the many years of carrying these heavy loads, and young men shifting the baskets uncomfortably, as their young muscles were not yet accustomed to such abuse. This is the sort of labor that even I—who spent much of my life carrying hay bales and leading stubborn Jersey cows—cannot fully understand. These men break their bodies, day in and day out, for less than fifteen U.S. dollars a day. 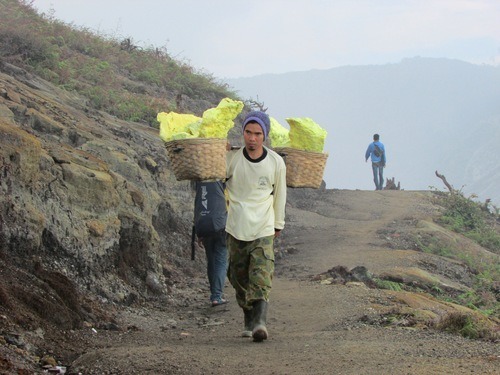 Climbing Kawah Ijen was one of those moments in Indonesia that showed me how much for which I have to be thankful. 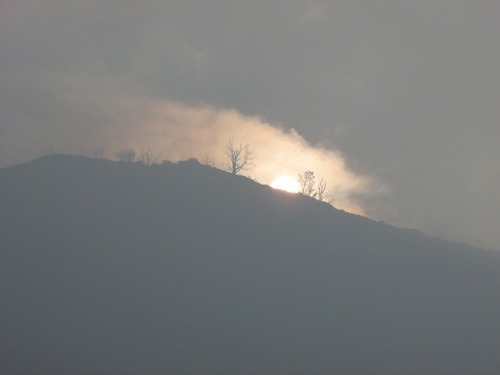 I am healthy enough, and monetarily stable enough, to take advantage of the opportunity climb to such an amazing place. I am unlikely to ever need to work myself to my death in order to feed my family, due to the opportunities my college education gives me, and the small blessing of minimum wage in the U.S. I do not always remember how fortunate I am, and I am glad to have had the reminder. Two days later, I am still feeling the remnants of the exhaustion that resulted from our climb. But this is an ache I do not regret, because it merely acts as a reminder of one of the most incredible experiences I have ever had. 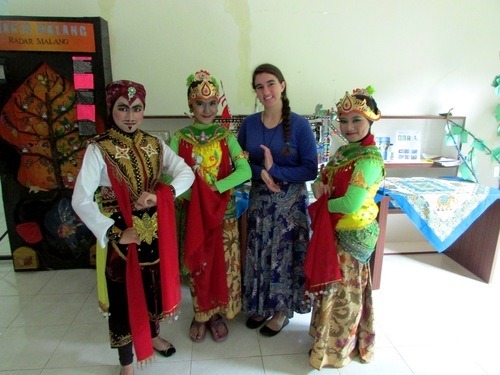 I have, by this point, officially reached the halfway point of my Fulbright grant, which means I am halfway through my time here in Indonesia. However, though I did not technically reach this milestone until I attended to Mid-Year Conference in Jakarta, where I was able to see all the lovely faces of my fellow ETAs, in many ways I feel as though I have already reached my own personal halfway point, with the changing of semesters. Perhaps this is partially due to the teacher in me, who finds it easier to interpret a year through semesters and units than through the more typical months and weeks. More so, I believe it is because the actual “Mid-Year” came right in the middle of the many adventures of the new semester, while the change in semesters came after two weeks of no school, and traveling and reflecting with some of my favorite ETAs. 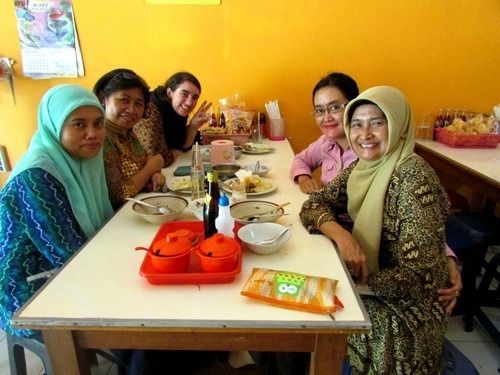 This is not to say that I did not learn anything from my week in Jakarta: indeed, I came home brimming with new ideas I could not wait to use in the classroom. But I had already come into the new semester with new ideas for how to navigate different parts of my professional relationships and social life as they exist in this new culture, which are arguably much more challenging than the more familiar classroom struggles. In part because of my new determination to find my place here, and in part due to just the natural passing of time, I have enjoyed a significant change in my experience from the first semester, to the second semester. I have come to understand this marked change through two of the most commonly used Indonesian words there are: belum and sudah. Belum and sudah translate to “not yet” and “already,” respectfully. Indonesians are loathe to say tidak, or “no,” directly (it is a hopeful language, and “no” is too harsh for their mindset), and therefore they often use the word belum in its stead. Sudah is not only used in the manner in which English speakers use “already,” but also sometimes to indicate anything that has happened in the past. I cannot get through even the smallest conversation in Indonesian without either hearing, or saying myself, at least one of these words. Belum is the definition of knowing you do not yet belong. Belum can make you frustrated with yourself, your teachers, the handwritten sign on the warung where you want to buy jus strawberry. On your worst days, belum can make you want to pack up your bags and return to the people and places you know and understand. 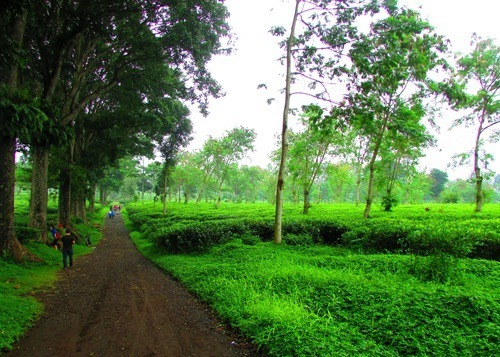 But belum is worth the struggle, because just beyond belum, bathed in tropical sunlight and resting in a valley of rice paddies and sugar cane, is the magical land of sudah. Since coming back to my school from break, I have started to hear the word sudah with a much higher frequency than I did before. Though I cannot hold any conversation without slipping into a campuran (mix) of English and Indonesian, it seems that any time I talk to anyone this semester, they feel the need to pause the conversation, point and me, and say to whomever is walking by, “Sudah pintar Bahasa Indonesia!”  I personally feel that claiming I am “Already good at Indonesian!” is a bit of a stretch, but I’ve been working on accepting compliments, and so I just smile politely and look pointedly at the ground. Occasionally, one of the older, sweeter ibu-ibu at my school will smile across the our lunch table piled high with bakso (the Indonesian version of meatballs, usually used in soup, which is especially fampous in Malang), and Nasi Padang (a spicy selection of foods originally from Sumatra), and say to me, “Sudah lancer!” (“Already fluent!”). To this one, I always respond, “Belum, Bu, belum.” I feel closer to sudah lancer every day, but I still have a long way to go. Eating has also caused an increase in sudah. While, before, I would only sometimes eat with my hands, keeping my trusty sendok (spoon) tucked in my purse just in case a dish proved too challenging for my clumsy fingers. Now I shamelessly dig in, causing my ibu-ibu to exclaim happily, “Sudah bisa makan pakai tangan!” (“You can already eat with your hands!”). My spice tolerance has also increased gradually, so that while I used to ask for food tampa (without) sambal (the Indonesian equivalent of salsa, which usually is a danger level of spicy and which they put on everything), I sometimes find myself asking people to tambah (add) more. 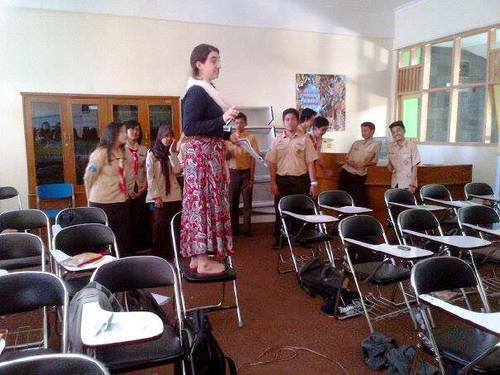 “You already have the Indonesian taste,” one of my co-teachers told me just recently. The importance of this change is not to be underestimated. 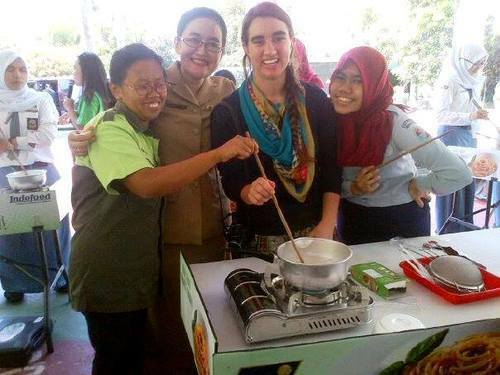 Indonesians love food: the fact that I can now happily enjoy their cuisine might be more important to them than the fact that I am trying to learn their language. While some of my transformation from belum to sudah has been gradual, such as my language learning and my Indonesian palate, there was one change I made from one semester to the other that created an immediate sudah, and it was not one which I expected. changed, well, everything. My trusty steed is a ten-year-old automatic which I am renting from a lovely ibu with two adorable children, to whom I am referred to as “Auntie Grace.” It’s scratched and bent from previous bule renters, it is not the most impressive ride, but it has already done so much for me. Not only has riding a motorbike given me renewed freedom of mobility, something I was feeling a significant lack of in my first semester, but it has changed almost every interaction I have here. Male teachers who wanted nothing to do with me before now ask me about where I have been on bike, and how fast I drive. Students whom I was having difficulty getting to know now wave ecstatically every time I drive by. Asking for directions when out walking, I am more likely to be told that I should not be walking alone than actually given guidance as to what turn I should make. On a motorbike, becak drivers and warung owners alike are morelikely to provide the help I am asking for. It’s a baffling change. “Sudah berani” (“already brave”), smiles one of my favourite ibu-ibu, and I can barely keep the confusion off my face. I confess, after the persuading I had to do to convince my teachers to let me rent a motorbike, and after hearing so many of the female teachers talk about how their fathers and husbands will not let them learn to ride a motorbike, I expected hearty disapproval of my mode of transportation. But Indonesia is always full of surprises, and the very thing which I worried would cause others to think ill of me has, rather, provided me with more respect than I have enjoyed since coming here. In many ways, I am still navigating the realm of belum, and to some extent I probably will be right up until the day I leave. But there is beauty in the struggle, and with one foot firmly in belum, and the other testing the waters of sudah, I am excited to drive off into the second half of my Indonesian adventure. can be sudah pintar bahasa Indoensia, but also sudah pintar badminton. As someone who used to read Howard Gardner for fun, I have a small internal party every time I hear it used this way.